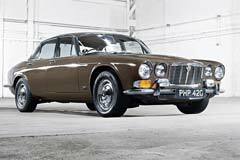 The first model of the XJ6 series was manufactured in 1968 and continued to evolve up till today. The Jaguar XJ6 first generation is now considered a classic car that can be just as expensive as a new model. Since the very first model, the XJ6 remained a flagship luxury British car. All models were full-size four-door vehicles. The smallest engine used was a 2.8 liter V6 while the latest version introduced a 5.0 L V8. Except for the latest generation, all models featured two pairs of small round headlights with a discreet grill in between and an even smaller air vent beneath. The front bumper was slightly overextended. Only the models produced after 2009 broke the line in terms of traditional Jaguar design elements featuring sport-like vents, a larger grill and larger headlights. The interior of all models featured leather seats as standard option with high quality materials, attention to details, wood textured decorations and analog gauges and instruments that maintained its classic yet luxurious look. 1991 Jaguar XJ6 Souvereign 1991 XJ6 Souvereign 85000 miles dependable every day driver. 1986 Jaguar XJ6 PRISTINE TIME MACHINE !! 70 K , HIDDEN IN A GARAGE ! !